Loading a Loss in weight feeder that is operating in a continuous mode requires the right kind of equipment. The objective is to refill the feeder as quickly as possible. 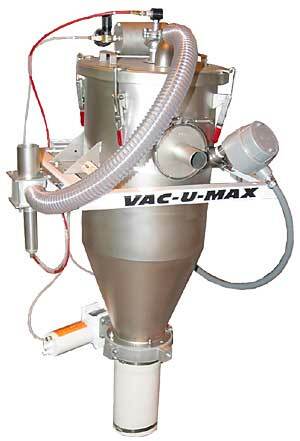 VAC-U-MAX offers the fastest way to reload a feeder in the material handling business. Many times the Feeder is purchased without consideration of how the feeder will get filled and refilled. At VAC-U-MAX we have made it very easy. When the feeder reaches a low level signal the discharge valve on the VAC-U-MAX Vacuum receiver will open refilling the feeder in a matter of seconds allowing it to operate in gravimetric mode as soon as possible. VAC-U-MAX accomplishes this by having a charge of material ready in the vacuum receiver at all times. The sequence of events is as follows. The operator turns on the VAC-U-MAX Control Panel, which is interfaced with the feeder control panel, and then turns on the vacuum source. Once this is done and the material is available at the pick up point (point where vacuum, suction, is available) the vacuum receiver will fill to a high level. The material is immediately discharged into the feeder allowing the feeder to begin dispensing product. The discharge valve on the vacuum receiver will close and more material will be conveyed into the vacuum receiver and held there until the feeder signals a low level mode. The process will repeat itself until all the material has been conveyed or when the operator turns off the control panel. 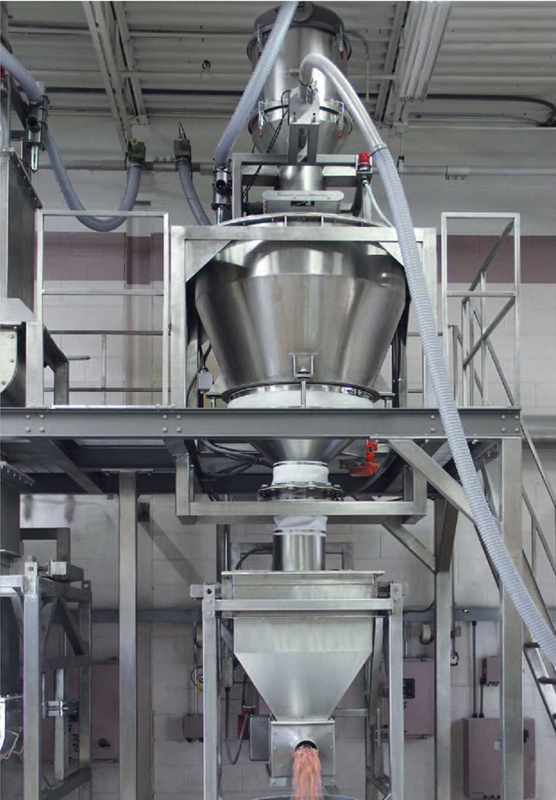 Volumetric FeederReloading a Loss in Weight feeder that is operating in batch mode is a little different than loading a feeder operating in continuous mode. Typically the feeder will be able to hold enough material for the entire batch. Once the batch is emptied from the feeder there may be a time gap to allow for reloading of the feeder. 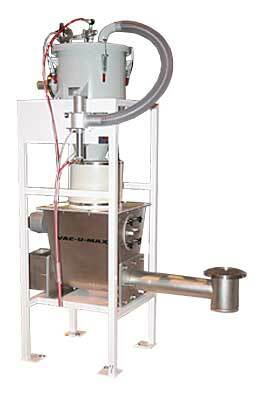 VAC-U-MAX offers many different sizes of Vacuum Convey system to accomplish the loading of a Batch Feeder. These systems range in convey rates from 500 pounds per hour to 10,000 pounds per hour and all the systems are controlled using a VAC-U-MAX designed control panel interfacing with the control panel of the feeder. Our programmers can program the system to begin conveying at anytime, when the feeders control panel sends a signal or to calculate a time gap and then begin conveying and loading of the feeder.